If you’ve ever seen a presentation by the UBC student group, Universities Allied for Essential Medicines, or any by, Dr. Kishor Wasan or any NGDI member, you’ll probably recognize the picture of Joseph Jeune below. 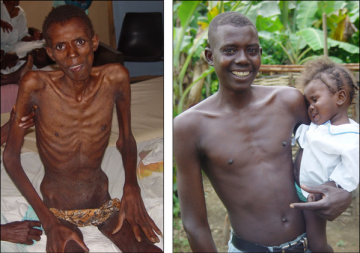 His is a story of “Lazarus rising” from the ashes through the treatment of his HIV/AIDS in Haiti. When I first started as Coordinator of NGDI in 2010, I wondered about this man, about the unbelievable transition from decimation to health – it seemed miraculous. Today, I read a wonderful story on the Partners in Health blog, “Remembering Ti Joseph: Patient, Friend, and HIV Advocate”. He sadly did pass away in January of last year, but truly, “his life was not in vain”. Here are some snippets from the post, but I recommend reading the whole story. “Joseph Jeune used to carry a folded pamphlet from the World Health Organization in his back pocket. It described the international body’s “3 by 5 Initiative,” dedicated to getting 3 million people on antiretroviral therapy (ART) for HIV by 2005. On the left was a picture of a wide-eyed, emaciated patient who teetered on the brink of death. On the right was the same man, this time smiling, 30 pounds heavier, and proudly balancing his niece on a sturdy hip. The transformation was breathtaking. Jeune was a star to his family and friends, and particularly to his doctors working in clinics supported by Zanmi Lasante, as Partners In Health is known in Haiti. The illiterate peasant farmer and shoe shiner turned community health educator was an iconic symbol of the power of ART and the importance of delivering it to patients all over the world—regardless of income or social status. His recovery, and resulting fame in the global health world, earned him a platform from which he advocated for the compassionate care of poor people living with HIV and tuberculosis. “By September, Jeune had returned to his home and gained 45 pounds. His TB was cured. And he religiously took his ART. He was doing so well that he started taking classes in community health education at the Lascahobas clinic. PIH offered him a job and he soon became a jack-of-all trades there. So when Farmer approached Jeune about sharing his before-and-after pictures with the World Health Organization, where fellow PIH Co-founder Dr. Jim Yong Kim was working at the time, Jeune jumped at the chance.